We investigate supersymmetric scenarios in which neutrino masses are generated by effective d = 6 operators in the Kähler potential, rather than by the standard d = 5 superpotential operator. First, we discuss some general features of such effective operators, also including SUSY-breaking insertions, and compute the relevant renormalization group equations. Contributions to neutrino masses arise at low energy both at the tree level and through finite threshold corrections. In the second part we present simple explicit realizations in which those Kähler operators arise by integrating out heavy SU(2) W triplets, as in the type II seesaw. Distinct scenarios emerge, depending on the mechanism and the scale of SUSY-breaking mediation. In particular, we propose an appealing and economical picture in which the heavy seesaw mediators are also messengers of SUSY breaking. 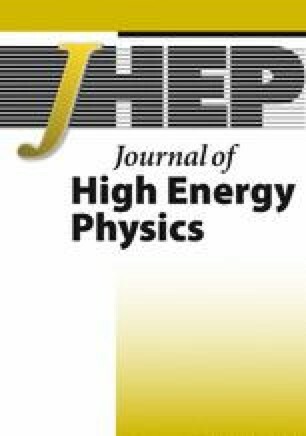 In this case, strong correlations exist among neutrino parameters, sparticle and Higgs masses, as well as lepton flavour violating processes. Hence, this scenario can be tested at high-energy colliders, such as the LHC, and at lower energy experiments that measure neutrino parameters or search for rare lepton decays. The MINOS collaboration, P. Adamson et al., New constraints on muon-neutrino to electron-neutrino transitions in MINOS, arXiv:1006.0996 [SPIRES]. G.L. Fogli, E. Lisi, A. Marrone, A. Palazzo and A.M. Rotunno, SNO, KamLAND and neutrino oscillations: θ 13, arXiv:0905.3549 [SPIRES]. U. Ellwanger, C. Hugonie and A.M. Teixeira, The next-to-minimal supersymmetric standard model, arXiv:0910.1785 [SPIRES]. A. Melfo, A. Ramirez and G. Senjanović, Type II see-saw dominance in SO(10), arXiv:1005.0834 [SPIRES]. F. Borzumati and T. Yamashita, Minimal supersymmetric SU(5) model with nonrenormalizable operators: Seesaw mechanism and violation of flavour and CP, arXiv:0903.2793 [SPIRES]. MEG collaboration, E. Baracchini, First result from the MEG experiment, arXiv:1005.2569 [SPIRES]. T. Aushev et al., Physics at super B factory, arXiv:1002.5012 [SPIRES]. M. Bona et al., SuperB: a high-luminosity asymmetric e + e − super flavor factory. Conceptual design report, arXiv:0709.0451 [SPIRES]. MINOS collaboration, J.M. Paley, Recent results and future prospects from MINOS, arXiv:0901.2131 [SPIRES]. T2K collaboration, Y. Obayashi, Reach of future accelerator and reactor neutrino efforts, arXiv:0807.4012 [SPIRES]. NOvA collaboration, D.S. Ayres et al., NOvA proposal to build a 30-kiloton off-axis detector to study neutrino oscillations in the Fermilab NuMI beamline, hep-ex/0503053 [SPIRES]. Double CHOOZ collaboration, F. Ardellier et al., Double CHOOZ: A search for the neutrino mixing angle θ 13, hep-ex/0606025 [SPIRES]. Daya-Bay collaboration, X. Guo et al., A precision measurement of the neutrino mixing angle θ 13 using reactor antineutrinos at Daya Bay, hep-ex/0701029 [SPIRES]. COMET collaboration, Y.G. Cui et al., Conceptual design report for experimental search for lepton flavor violating μ − − e − conversion at sensitivity of 10−16 with a slow-extracted bunched proton beam (COMET), KEK-2009-10 http://ccdb4fs.kek.jp/tiff/2009/0924/0924011.pdf [SPIRES]. Mu2e collaboration, R.M. Carey et al., Proposal to search for μ − N → e − N with a single event sensitivity below 10−16, FERMILAB-PROPOSAL-0973 [SPIRES].